CERTivity is a powerful Java multi-platform visual tool for creating and managing different KeyStore types (such as JKS, JCEKS, PKCS12, BKS, UBER, or Windows Native), TrustStores, Keys such as Private / Public Keys or Secret Keys in different formats (e.g. PKCS, OpenSSL, using various algorithms - RSA/DSA...), Certificates and Certificates Chains, viewing CRL and CSR files and inspecting file types. CERTivity offers many features related to KeyStore management and PKI domain like exporting/importing KeyPairs, Private/Public Keys and Certificates, Trust Path validation and management, Certificate Extensions management, import SSL certificates from servers, extend validity period for self-signed certificates, testing given certificates on custom protocols (e.g. 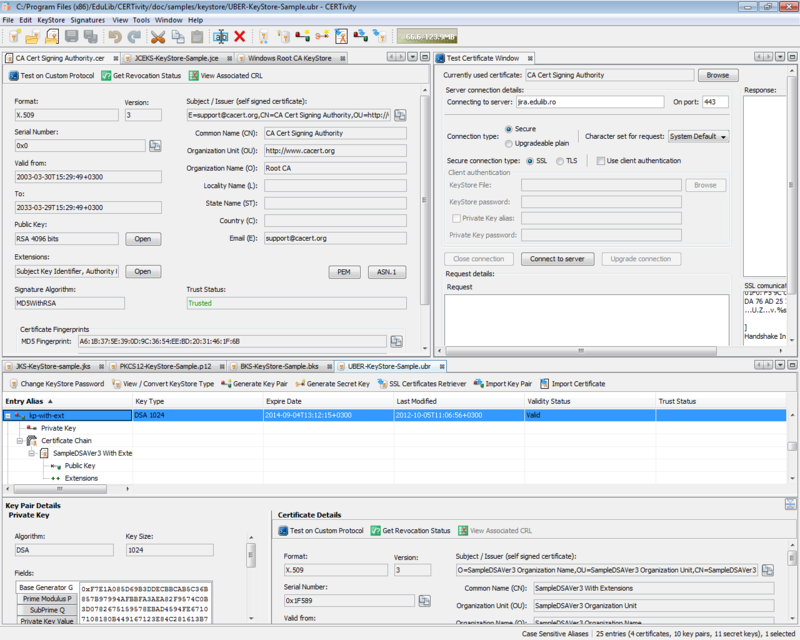 raw text such as STARTTLS), obtain revocation status and view associated CRLs, KeyStore type conversion, simplified certificate signing and acting as a test CA. CERTivity can sign and verify signatures on PDF, XML, JAR / APK or CSR files. For PDF signatures it covers all of the standard SubFilter values "adbe.x509.rsa_sha1", "adbe.pkcs7.detached" and "adbe.pkcs7.sha1", as well as providing rich and "intriguing" information on signature verification. Signatures on XML documents can be used as authentication credentials or as a way to check data integrity. XML signatures can be applied to XML files, HTML pages, binary-encoded data and any XML-encoded data. CERTivity can verify XML signatures using either certificates embedded in the signature, or using a certificate given by the user. CERTivity brings up the ability to sign and verify JAR files, to ensure the integrity of Java archives, and also has the ability to sign and verify APK files (for Android applications development). As the features are combined and centralized having an intuitive and productive organization, CERTivity is offering to developers and system administrators, and to all users in general the possibility to maximize productivity. This site does not contain serial number, crack, keygen CERTivity KeyStores Manager serial number : serial number is the simplest type of crack. A serial number(cdkey,product key,etc) is register the program as you may already know. a crack or keygen may contain harmful software. If you cannot find the exact version you want, just give it a try. for more information read .nfo/.txt/.diz file include in zipped file.